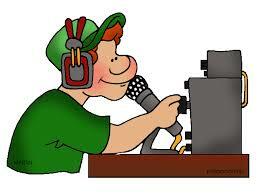 Amateur radio networking utilizes off the shelf wireless equipment in combination with custom software to form a ham radio internet, using both Part 97 and Part 15 frequencies in the 900 MHz, 2.4, 3, and 5.8 GHz bands. We recommend starting with 5 GHz user access if you have a reachable local access point on that band. Why? Because the 5 GHz band has more available bandwidth for hams than 2 GHz, the band is quieter, and the equipment costs about the same. Check the Mesh Access Point list to determine your nearest local backbone node. Even if you start out on 2 GHz and later transition to 5 GHz, it’s not money wasted. Having both links available provides for some network redundancy during outages. The equipment isn’t expensive: each of the 2 and 5 GHz Ubiquiti Nanostations can be bought for about the price of two Chinese handie-talkies. A network node. 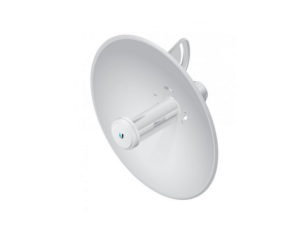 For close in work (less than about 5 miles from your main access point with clear line of sight): either Ubiquiti Nanostation M2 or M5 (preferred if local user access is available). For longer distances or slightly obstructed LOS, consider purchasing an Ubiquiti PowerBeam for the appropriate band. 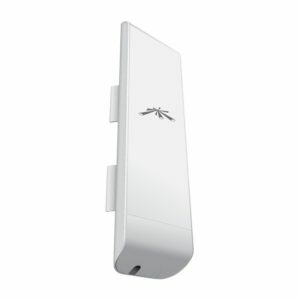 Current recommendation for 5 GHz is the Ubiquiti PBE-M5-300. Can be purchased on Amazon, or occasionally on EBay for a bit less. Note – A power supply is included with each node. Note – the use of older Ubiquiti gear (the Bullet and other non-MIMO equipment) is discouraged, due to their significantly lower throughput. Outdoor-class Cat 5 Ethernet cable, length to suit. Note: Ubiquiti recommends shielded cable but in our benign California environment, for a home installation it may be overkill. If you’re comfortable with adding RJ45 plugs to raw cable then that’s the way to go, otherwise pre-terminated lengths can be purchased many places. Most importantly – line of sight is needed to one of the user access points. not sure if your QTH can make the haul to the nearest access point? You can use HeyWhatsThat Wisp or other on-line LOS calculators to help determine what can be seen from your QTH. Once you have your hardware in hand, the AREDN software has to be installed. Follow the directions on the AREDN web site here. NOTE – the nightly builds have many new features and support more brands/models than the production release. Recommend installing the nightly build for your Ubiquiti radio. NOTE: if you install the nightly builds, you do NOT have to run the U-Boot test and you do NOT have to downgrade the existing AirOS firmware. After it’s installed, if you’re in Ventura County or the San Fernando Valley configure it per the standards here.